Last week, I received a FaceTime call from my wife, Lindsay. I answered it even though I was in the middle of doing some planning with a colleague. It’s unusual for me to receive a FaceTime call that doesn’t have to do with one or both of our children. I was a little anxious to answer, as I tend to over-worry. I’m very glad I took the call. Lindsay was beaming on the other end of the line. She started out by saying, “I had a feeling you might be on lunch break.” I said I wasn’t actually on a break, and she offered to hang up. But, as I really wanted to know what was going on, I asked her to stay on the line and tell me what was up. This was an excellent reason to be interrupted at work. I was so proud of my little dude. It’s been quite a while since we started potty-training with him, but he’s always been afraid to drop a deuce in the potty chair. In fact, his reticence to take the Browns to the Super Bowl is the reason we haven’t been able to sign him up for pre-school. We hoped to enroll him this fall in Green Bay’s oldest pre-school, which happens to be housed in the lower level of the awesome church we (admittedly, infrequently) attend. Everyone who has gone there or has sent their kids there raves about it. 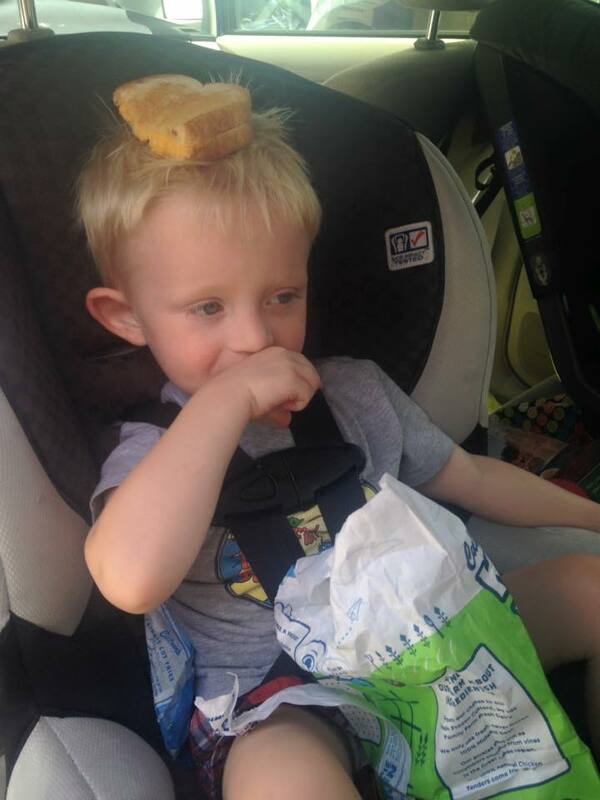 Very soon, this handsome little boy will convert the grilled cheese and chips into poop. So, this positive pooping experience was more than just a relief that our boy is overcoming his anxiety. It also opens up the opportunity for him to be around several other kids a few days a week, learning new songs, games, art techniques, and social skills. Upon returning to the work meeting, I bragged to another teacher whose children had gone through the same preschool. She was stoked for me, as we had spoken about this problem recently. In fact, when I said I had just received a phone call from home, she predicted exactly what I was going to tell her. Parents talk about their kids potty and pooping habits a lot. If you didn’t know that, now you know. P.S. In case you’re keeping score at home, during his first two days trying it out, our little guy dropped the kids off at the pool FIVE times. I’m a proud papa. This entry was tagged Anxiety, dropping a deuce, FaceTime, Lindsay, poop, pooping, potty-training, pre-school. Bookmark the permalink.